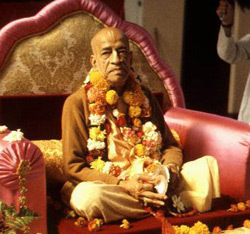 What follows is a transcription of a talk given by Srila Prabhupada in Montreal in observance of Janmashtami in 1968. A transcription of this lecture is also available on the Bhaktivedanta Vedabase. So, today is the birth—appearance ceremony—of Lord Krishna. "My dear Arjuna, any person who simply tries to understand about My transcendental birth or appearance and disappearance and activities, janma karma..."
The Personality of Godhead is not niskriya, without activities. So anyone who can understand what kind of activities the Lord has and what kind of birth He accepts; simply by understanding these two things one gets wonderful result. What is that? Tyaktva deham. By quitting this body—tyaktva deha punar janma naiti [Bg. 4.9]—he does not take any more birth in this material world. Tyaktva deham punar janma naiti. Some of us may think that “punar janma naiti” means he becomes vanquished. No. Punar janma naiti, but mam eti, "He does not come to this material world, but he comes to Me." Mam eti. Mam eti means, then...the supreme personality of Godhead has His place, the...abode where we can go, simply by understanding the nature of His appearance and activities. So today is that auspicious day, Janmashtami, when Lord Krishna appeared—five thousand years ago—in India, Mathura. Those who are Indian ladies and gentlemen present, they know very well where is Mathura. It is about ninety miles south of New Delhi. Mathura is still existing, and it is eternally existing. . .
Krishna appeared in Mathura in His maternal uncle's house in a very precarious condition. That birthplace, Lord Krishna's birthplace, is now maintained very nicely. One who goes to India, they see. So anyway, Lord Krishna appeared on this planet five thousand years ago. Now Krishna says, janma karma me divyam [Bg. 4.9]. Divyam means "not ordinary." It should not be understood just like we take our birth. Krishna does not take his birth like us. That is also explained in the Bhagavad-gita: when Arjuna inquired from Krishna, "My dear Krishna, You are speaking that formerly You spoke this yoga system of Bhagavad-gita to the sun-god. That means it is millions and trillions years ago You spoke. How can I believe it?" Because Krishna was contemporary to Arjuna, so he was thinking that "Krishna is my friend, is my cousin brother. How it is possible that He spoke this Bhagavad-gita yoga to sun-god?" So what was the reply? The reply was this, that "You also appear many, many times; I also appear many, many times. The difference is that I can remember. You cannot remember." That is the difference between God and ordinary living creature—that we are also taking birth after birth. . .
Bhaktya mam abhijanati yavan yas casmi tattvatah [Bg. 18.55]. Again the same thing, tattvatah, “in truth.” If anyone wants to know God, or Krishna, in truth—not superficially—then he has to undertake the process of devotional service; Bhaktya. "Any person who gives Me a little fruit, little flower, little water, but with devotion, bhaktya..." That is the only qualification. So Krishna says, taya bhaktya upahrtam asnami. "Because he brings it with devotion and faith and love, I eat." We are offering, in the temple, prasadam. So He eats because He says "I eat." How you can say that He does not eat? Some gentleman asked me that "Swamiji, you offer prasadam in the temple, but do you think Krishna or God eats?" I answered, "Yes, why not? He says, 'I eat.' How you can say He does not eat? But you do not know how He eats." angani yasya sakalendriya-vritti-manti [Bs. 5.32]. God's senses—Krishna's senses—are as powerful as other senses; just like I can see with my eyes, but Krishna can eat also with His eyes. That is angani yasya sakalendriya-vritti-manti. Just like, there are many examples. Krishna or Vishnu—the first creation is that Garbhosayi (Garbhodakashayi) Vishnu lying on the ocean and Brahma was created from His navel. There was a lotus stem grown from the abdomen of the Lord, and Brahma was born. Now Laksmi, the goddess of fortune, was just sitting. But as we understand that if we beget child, we require the cooperation of wife, but here we see that wife was sitting, but He begot Brahma from the navel. This is called sarva-shaktiman. He does not require anyone's help. He can beget child—not exactly as we beget child—therefore, janma karma me divyam [Bg. 4.9]. He is within your heart, He is everywhere, so He can appear from everywhere. Just like sun rises from the eastern side. It does not mean that eastern side is the “mother” of sun; we simply see that sun is rising from the eastern side. In this way, if we try to understand in truth, then we can understand what is God. Superficially, if we try to understand by our experimental knowledge, then it is not possible to understand God. The Brahma-samhita says that if one starts on the chariot of air and makes progress at the speed of mind, still one cannot understand what is God. Vedeshu durlabham adurlabham atma-bhaktau [Bs. 5.33]. He cannot be understood simply by studying Vedas. Traigunya visaya veda nistraigunyo bhavarjuna. One has to transcend the position of Vedas also. Then one can understand what is God or what is Krishna. bhaktya mam abhijanati yavan yas casmi tattvata? [Bg. 18.55]. So this bhakti—devotional service of Krishna—is so nice. And under that bhakti category, this Janmashtami... Of course, this Janmashtami ceremony is observed by all Hindus—irrespective of becoming Vaishnava or not, this ceremony is observed in India every home. Just like in your Western countries the Christmas is observed in every home, similarly Janmashtami is observed in every home. Today is a great ceremonial day. So our program is; at twelve o'clock night the Lord will take birth and we shall receive Him. And just now it is ten o'clock. For two hours our program will continue in kirtan. Kirtan means sometimes chanting with music, and sometimes speaking. Both of them are kirtan. Kirtayati iti kirtanam. Whenever we glorify the Lord, that is called kirtan. The Srimad-Bhagavatam reading is also kirtan. Abhavad Vaiyasaki kirtane. . .
Pariksit Maharaja, he simply heard. Chanting, hearing—first hearing, then chanting. Without hearing, nobody can chant. And what sort of srava?a? kirtana?? Vishnoh, of Vishnu. Not anything else. These are nine processes of devotional service, of which sravanam, hearing, is most important. Without hearing, nobody can understand the science of God. Therefore the Vedic mantras are called shruti. Shruti means it is to be heard. It is not to be experimented in the laboratory. It is simply to be heard. Therefore it is called shruti. srava?a? kirtana? vi??o? smara?a? pada-sevanam arcana? vandana? dasya? We also offer prayer. The other religious sects—just like the Christians—they offer prayer. The Muhammadans, they offer prayer. So prayer—offering prayer—is also one of the items of bhakti; chanting, hearing, meditating, offering prayers, arcanam (worshiping the Deity in the temple), all of them are together devotional service. So out of the nine, if you can execute all the nine, it is very good. But it is not possible. So even if you can execute one item, you become perfect. It is so nice. Just like Maharaja Pariksit, he simply executed the function of hearing. He got perfection. abhavad vaiyasakih kirtane. . .
Vaiyasaki means Sukadeva Gosvami. He simply glorified the Lord. Prahlada Maharaja, he was simply meditating. There are many examples; simply by following one principle of this devotional service, they got the highest perfectional life— liberation, back to home, back to Godhead. So we shall invite today to speak about Krishna from our students, as well as all the members who are present here. So I shall request Janardana to speak something about his realization of Krishna.